Shaggin’ on the Cooper is Back! It’s beginning to feel a lot like Summer! While the season is not officially here, one of our favorite Lowcountry events certainly is! Put on your shaggin’ shoes and head to the Mt. 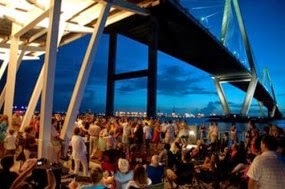 Pleasant Pier for an evening of dancing under the stars (and the Ravenel Bridge) to a variety of local bands. The fun begins this Saturday, May 16th, and continues through the Summer. Check out the full schedule HERE. The cost is only $10, and food & drinks are available for purchase. Shaggin’ on the Cooper is a fun event for all ages – and a great chance to learn the South Carolina State Dance!